A quick and tasty dessert using black cherries, raw cacao powder and fruit. No refined sugar, gluten and dairy free and paleo. Gorgeous, too! They're tasty and they look kind of cute squished into the top of any dessert. Proper retro. But they're also incredibly good for you, too. Cherries contain antioxidants and are thought to be a great anti-inflammatory, as well as helping to support your melatonin levels, contributing to your natural sleep patterns. This dessert is gluten, grain, dairy, nut and refined sugar free. In fact I didn't need to add any honey or maple syrup at all. I've added a dash of raw cacao powder to the mixture, to give it that Black Forest flavour. We loved it. Hope you do too. Put all the ingredients in a blender or use a stick blender like I do, and pulse until well-mixed. You should have the consistency of soft ice cream. 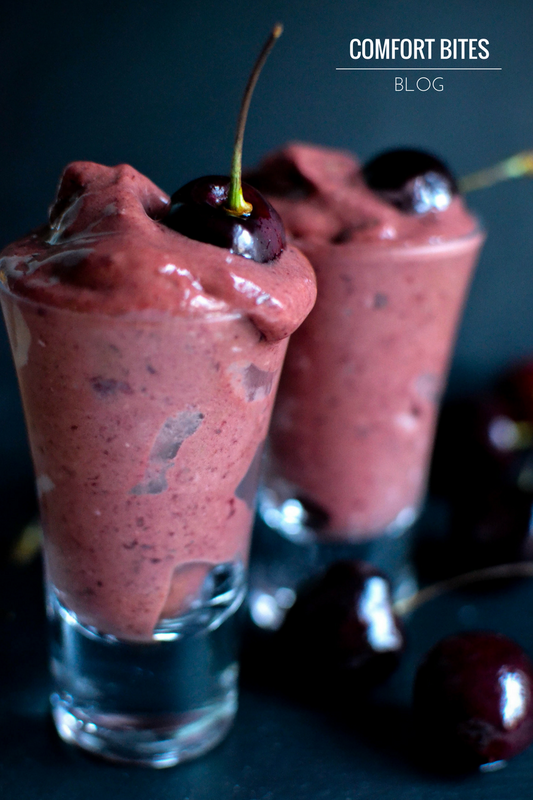 Spoon into two shot glasses and add a fresh cherry on the top if you like. Made this recipe? Post a pic on Instagram and tag me in @joromerofoood. I love to see your versions of my recipes!